The merger of Russia's major stock exchanges is a step toward the creation of an international financial center in Moscow. Russia’s two leading exchanges, MICEX and RTS, will merge into a single exchange. 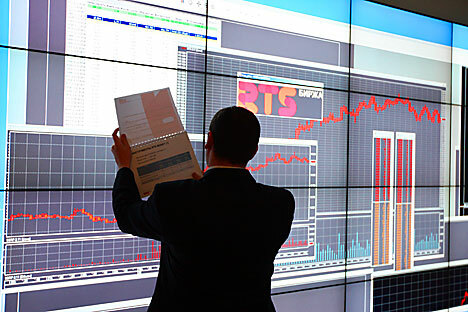 MICEX signed an agreement of intent to buy a controlling stake in RTS, and the deal will become legally binding by mid-April, Alexei Ulyukayev, the first deputy chairman of the Central Bank, announced. Ulyukayev said the deal valued MICEX at $3.45 billion and RTS at $1.15 billion. "We are united in our ambition to merge the two trading floors. The first stage of negotiations is over, and today we are signing an agreement of intent to buy the controlling stock in RTS by MICEX," said Ulyukayev, who is also chairman of the MICEX board of directors. The Kremlin sees merging the two exchanges as a big step forward in creating an international financial center in Moscow. On Jan. 20, Medvedev ordered the Central Bank to sell its 29.8 percent stake in MICEX, which hosts about 70 percent of the country's share turnover and also holds hard currency trading. Medvedev restated the plan for the international financial center last week during the World Economic Forum in Davos, Switzerland. floated the idea, the management of RTS announced the exchange would IPO, thus making it more difficult for a merger to proceed. RTS shareholders have resisted a merger because of the Central Bank's holding in MICEX. Ulyukayev said that the Central Bank would withdraw from the capital of the new merged stock exchange within two or three years. With the announcement, the procedures on the IPO have been suspended and frozen, but they might be resumed if the MICEX-RTS merger fails to come through, said Zhak Der Megredichyan, chairman of the RTS board of directors. Ulyukayev confirmed the information. The controlling stake in RTS is being sold by five shareholders - Renaissance Capital, Aton, Alfa-Bank, Troika Dialog, and Da Vinci, Megredichyan said. "At the moment, we are talking about shareholders who control over 50 percent of RTS shares, and the others we hope will agree with this," Megredichyan said. The timing of the deal is poignant, as the idea of merger was first suggested during the Troika Dialog annual investment conference last February. This year’s Troika conference, a major investment event, is due to start Feb. 2.